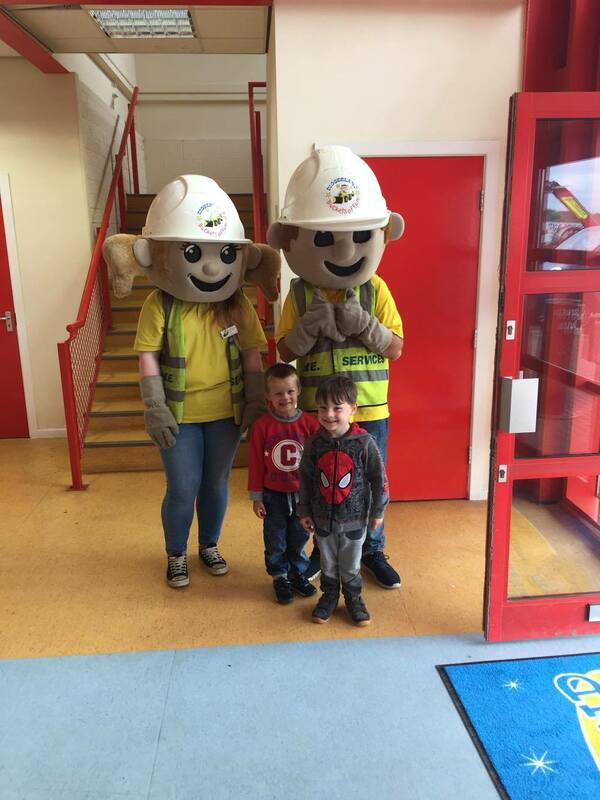 The nearest Diggerland to us is around 15 minutes away but oddly enough we have never actually been as a family before. We had 2 adult and 2 kids tickets so Jared brought along his friend Nicholas. When we drove up to the car park we drove past lots of diggers all painted to look as though they have faces which got the kids all excited (on account of us keeping the day trip a secret) Once we had parked we walked up to the entrance to be greeted by the official Digger Land mascots, Duggy & Dotty. When we went into the park it was a JCB lovers paradise. With 21 different rides and activities to do it is safe to say we didn't know where to start. We decided to start at the very back and work out way back to the exit. 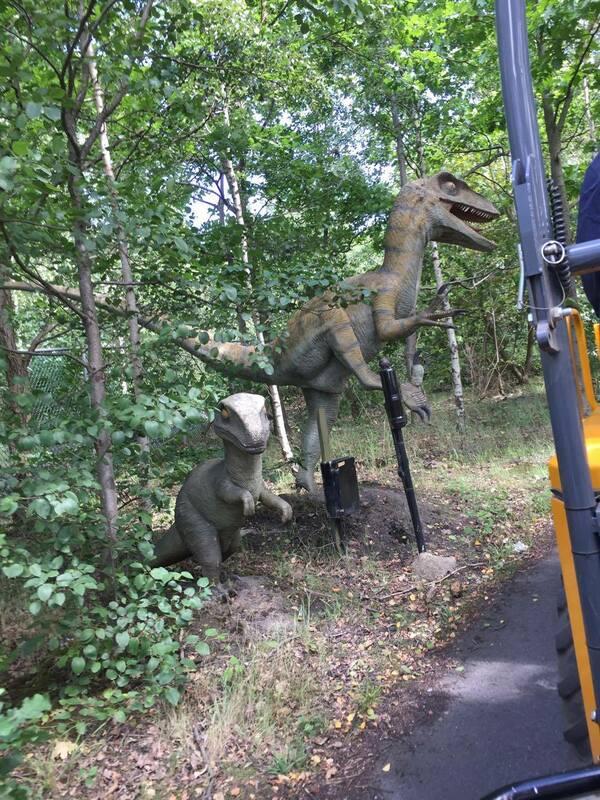 The first ride we went on was the train that took you through a dinosaur & gnome wood. The kids got to sit in their own carts with little steering wheels which added to the excitement for them. From there is was onto the Jungle Safari, You drive around an off road dirt track in a Jeep and try and spot jungle animals. Jared's first reaction was "WOW! It's like Jurassic Park" they loved it that much that they went on it twice! From there it was onto the Groundshuttle. The digger raised you in the air then took you out to a dirt patch and started spinning around and driving at speed. 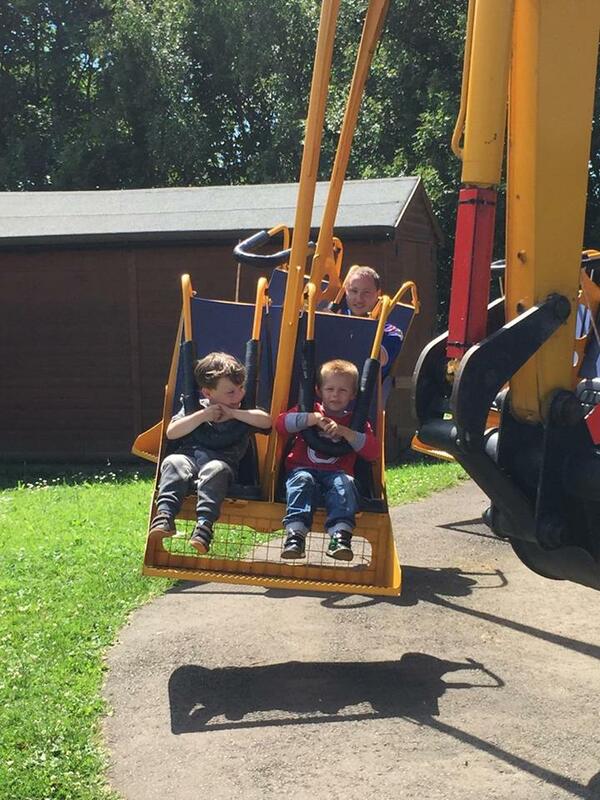 I personally really enjoyed it, the kids... not so much (as you can see in the photo), it was hard to predict which was the digger would spin so was difficult to shift your body weight to make sure you didn't fall off the seat. We made our way over to the Robots, our task was to manoeuvre a little digger through a muddy track. It was much harder than it looked, you could feel the digger slipping around in the mud which meant you had to really concentrate to make sure you didn't get stuck. It was really good fun and the controls were simple enough to allow young children to take control of the vehicle. Next to the robots were rows of excavators all with different mini games, you could dig for gold, try and hook a duck or try and knock down as many skittles as possible. We tried them all and my favourite was the skittles, you swung the ball using the diggers arm, almost like you would swing a wrecking ball. Jade took Nicholas on the hook a duck which looked tricky, trying to keep the hook still took a lot of skill and co-ordination. I then went on a ride on my own. Neither of the kids wanted to go on the Skyshuttle that raises you 50feet in the air. The view from the top was outstanding however I wouldn't recommend it to anyone scared of heights. I was sat on the edge and it is a little nerve wracking seeing the ground get further and further away. We took a ride in a back hoe over the mud field and even went for a swing in the digging scoops before driving around in the dumper trucks There is also a little play area for younger kids which has little tykes cars, water tables, go karts and there is also a big indoor play area for if the weather turns mid-way through your day out. 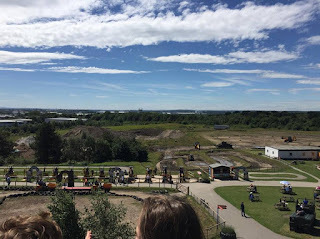 The best bit about Diggerland is that all the rides and activities are free except of the coin operated go karts and dodgems. 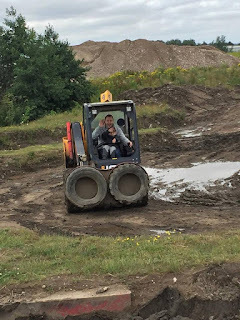 In terms of value for money it is great, you can taken your own picnic in to save money on food and if you kid or partner leave Diggerland thinking their not a professional digger operator then they are lying. You can check Diggerland out here which includes prices and locations. They have 5 sites throughout the UK. 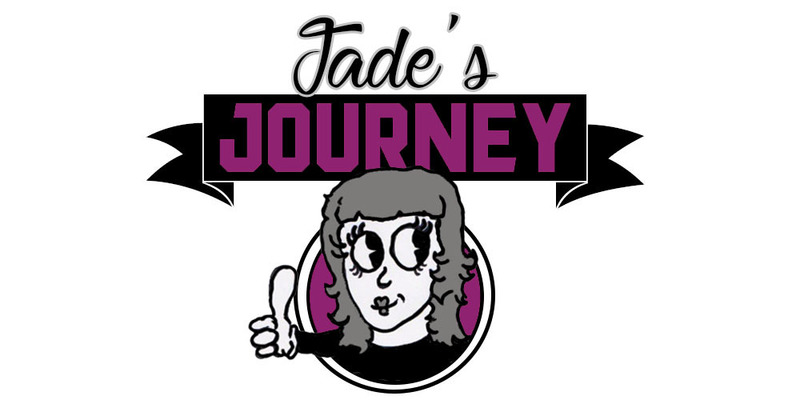 Overall we loved our day out, The activities we fun, the staff were great and if you got on a ride and it was just you waiting on it they would just set off rather than wait for a full ride which meant you were never really waiting to set off long. Disclaimer: tickets for Diggerland were sent to ourselves for free. This has not influenced my opinion on the attraction.